How We Talk by N.J. Enfield, offers fascinating insight into human conversation across many languages. It’s valuable for authors who write dialogue and anyone who wants more insight into real-time communication. This is yet another in a series of reviews of Books for Writers – books that are not, ostensibly, about writing, yet offer important insights into the practice or craft. I’ve always felt that the term “conversational writing style” was a misnomer. When we write in a conversational style, we’re trying to give the impression of a friendly conversation, but it’s written, not spoken. The two parties (writer and reader) aren’t present at the same time. Calling it conversational is a stretch. Having read How We Talk: The Inner Workings of Conversation, I think we may need to come up with an entirely different label for a conversational writing style. The importance of these nonverbal factors reinforces the idea that without another person, you cannot have true conversation. Enfield writes of conversation as “an improvised duet.” The book will teach you to marvel at the wonders of human language and cooperation. Here are a few of the key points you might find useful or entertaining, particularly if you dream of creating realistic dialogue in your writing. The average time it takes to respond to someone’s question is about 200 milliseconds. The only way we can get there this quickly is if we anticipate the end of the other person’s question while composing a response. That 200 millisecond average includes variability on either side – sometimes the response arrives at the same time as the end of the question. In most cases, this doesn’t appear to be an interruption, so much as fluid conversation. “Even the simplest conversation is a collaborative and precision-timed achievement by the people involved,” writes Enfield. Conversation is as much music as speech. It’s hard to get that timing in written dialog, although you could influence the perception of timing through word choice. Also, any pause longer than a second after a question carries the heavy implication of a negative answer. How do you do that in prose? Aside: Aha! This is why podcast interviews and phone interviews can seem awkward. We want them to feel like conversations, yet we also want to avoid mid-air collisions and talking over each other. So, the timing is a little wonky. The book is filled with illustrative extracts of conversations from Enfield’s extensive research. Not a single one would make the cut in an edited work of fiction. No one wants to read through that. Our conversation is stuff with verbal fillers and traffic signals (go on, uh-huh, huh?, um.) We rarely speak in complete, grammatically correct sentences. We repeat or correct ourselves, often in as a result of responses or silence from others. This stuff is boring to wade through in print, but vital in real life. Don’t be accurate when writing conversation. If you’re a fiction writer doing dialog, please, don’t use this information to write truly realistic dialogue. However, you might gain insights into how to make your dialogue sound more authentic. For all of you who like to dictate your way to a conversational style: Be careful if you record yourself talking. This might help you get to a rough first draft, but then edit, edit, edit. Reading and listening are entirely different things. A disengaged listener has a devastating effect on storytelling. For writers: If you’re writing a story, you have no listener at all. You’re fighting against your natural instincts of looking to the listener for feedback and responses. It’s probably best to try out your stories on real people, or to at least imagine an engaged, inquisitive listener. If you’re interested in language and conversation, check out the book. 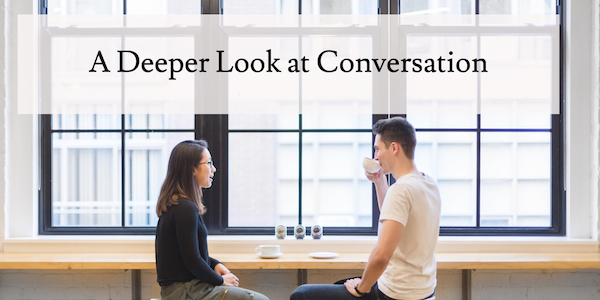 You’ll think differently not only about writing with a “conversational” tone, but also about the actual conversations you have during the day. Very insightful article. I’ve written a lot of dialogue but never stopped to think about conversation this deeply. Very cool and enlightening.